Want to know who will win today? In Today Dream11 Fantasy Cricket Prediction GAL vs COL 5th ODI Match-SL ODD, we will cover pitch report of R.Premadasa Stadium, Colombo, expected playing 11, toss prediction. To win any fantasy leagues, you need more details, so we will also cover players recent and past performance, all the latest news and updates of Colombo vs Galle teams, key players, the best choice for captain and vice-captain, Dream11 guru prediction, weather report of Colombo, best team for dream 11, where to watch live match of COL vs GAL and Live streaming details. Read More on IPL predictions. Make sure to read the complete post to get 100% benefit. All the details are absolutely FREE. you don’t have to pay a single penny for this. Just spend a couple of minutes in the post as every section contains important information. Where Can You Watch the Live Streaming of GAL vs COL, 5th ODI or Channels to Watch? Who Will Win the 5th Match Between COL vs GAL and Toss Prediction? 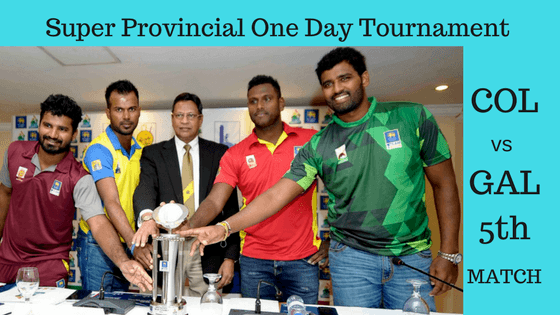 Match: Super Provincial One Day Tournament, 2018, Colombo v Galle, 5th ODI Match,. The pitch of Colombo, R.Premadasa Stadium, is a batting friendly pitch. The wicket has something for all the departments but initially, it will favour the batsmen and as the game progress it will start favouring the spin bowlers. The average first inning score of this ground is 232. Highest total on this ground is 375/5 in 50 overs by IND vs SL. Lowest total on this ground is 86/10 in 29.3 overs by NED vs SL. Note: If you have data of scoring pattern then you can make a guess that what could a team can make and which team will win the match. Colombo and Galle played one game against each other in previous year and COL defeated GAL on that match with a huge score. Colombo scored 307/8 in 50 overs and Galle in return could score 170/10. In Sri Lanka the 5th ODI between Colombo vs Galle will be broadcasted on SLC official YouTube Channel, SLRC (Channel Eye), and RASA FM on frequency 99.5 and 99.7. Lasith Abeyratne (wk), Thisara Perera (c), Dushmantha Chameera, Thikshila de Silva, Dilshan Munaweera, Samith Dushantha, Shehan Jayasuriya, Kamindu Mendis, Lahiru Thirimanne, Dilhan Cooray, Dhananjaya de Silva, Lasith Ambuldeniya, Chamara Silva, Dilruwan Perera, Kaveeshka Anjula, Lakshan Sandakan, Sachintha Peiris, Nipun Malinga, Wanindu Hasaranga, Angelo Perera, Vishwa Fernando, Dinesh Chandimal, Vikum Sanjaya, Nisal Francisco. Sadeera Samarawickrama (wk), Upul Tharanga (c), Ashen Bandara, Nisala Tharaka, SL Fernando, Ramith Rambukwella, Dhananjaya Lakshan, Roshen Silva, Mohomed Dilshad, Dasun Shanaka, Bhanuka Rajapaksa, Andy Solomons, Shammu Ashan, Seekkuge Prasanna, Nishan Peiris, Chaturanga de Silva, Chathura Randunu, Deshan Dias, Pushpakumara, Janith Liyanage, Irosh Samarasooriya, Suranga Lakmal, Madawa Warnapura, Lahiru Milantha. The previous time they faced each other, COL easily defeated GAL. Colombia have won their last two games and will be high on confidence. On the other hand, Galle won one and lost won. It will be interesting to see how both the teams make their playing condition. All the departments of Colombia team has performed well till now in this series. It is very unlikely that they will make any change in their playing 11 for today’s match, unless and until there is any series fitness issue. Shehan Jayasuriya, Chamara Silva, Lakshan Sandakan, Dilshan Munaweera, Dilruwan Perera, Lasith Ambuldeniya, Thisara Perera (c), Dhananjaya de Silva, Lahiru Thirimanne, Thikshila de Silva, Lasith Abeyratne (wk). Galle won their last match and they will want to continue with their winning combination. They will go with the same team unless and until there is any serious injury. Suranga Lakmal, Chaturanga de Silva, Upul Tharanga (c), Nisala Tharaka, Seekkuge Prasanna, Ramith Rambukwella, Sadeera Samarawickrama (wk), Roshen Silva, Shammu Ashan, Pushpakumara, Dasun Shanaka. Note: If you know the playing 11 of both the teams, you can easily make a best team in any fantasy leagues. Pro tips: Samarawickrama is a top order batsman and Lasith Abeyratne is a late middle order batsman. Try to take Samarawickrama over Abeyratne. For multiple teams make a combination of the above players. Pro tips: The above players are most likely to perform. For multiple teams make a combination of the above players. Pro tips: The above players has a very high chance of contributing points, either with bat or ball. You can take them as a captain and vice-captain. Pro tips: The above players has performed in the previous matches. You can take them as a captain and vice-captain. Colombo has been dominating in this series. Even COL won last match they played against each other. According to our astrology prediction Colombo will win today’s match against Galle. In most of the matches in this Sri Lanka ODD series, the team winning the toss has opted to bowl first and this will be seen in today’s match also. According to our astrology prediction, COL will win the toss and opt to bowl first. Conclusion: This is it for Today’s Dream11 Fantasy Cricket Match Prediction of GAL vs COL, 5th ODI Match, Sri Lanka ODI 2018, which will be played on Tuesday 8th May. You can give your valuable feedback in the comment section. Subscribe to our notification of latest updates. GOODBYE!